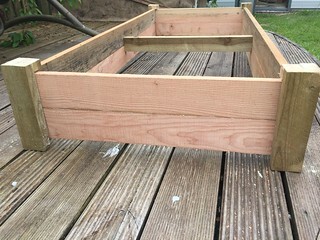 Previously I had posted about raised beds I made from old 8' scaffolding planks. Two big beds 8' x 4' and 8" in depth placed on top of the 'native' soil, which was poorly draining and waterlogged for 6 months + in the year. 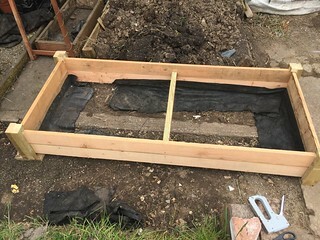 The beds served their purpose and I had some decent crops out of them over the years but they have completely rotted away and the remnants were pulled up last year. However I learned a few lessons , particular to my garden I'd agree that I wanted to apply to my new raised beds! Firstly I went for size rather than suitability. If I was going to build them at all I was going to build the biggest I could fit into the corner of the garden I had available. But half the length of the bed was in shade for most of the day, owning to boundary trees and crops in that end of the were never abundant. So lesson #1 place your beds where they will get a good spell of sunshine and if you not in a position to place your bed smack bang in the middle of your front lawn (if that's the sunniest!) then size your bed(s) to capture the most of the sun where every you have to put them. Secondly the scaffolding planks though thick (~2") really didn't last long sitting on wet soil, even with preservative. By year 3 the rot had well set in. Lesson # 2, timber rots when it's kept wet! So using a timber that is cheap or easy to hand is OK only if you want to rebuild anew every couple of years. And particularly if you are trying to be organic and avoid strong chemical preservatives most softwoods won't last. 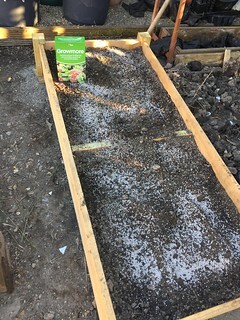 Final lesson was when placing your raised bed straight onto poorly draining soil you need good drainage still in your bed. Probably should have known this from the start but did think at the time that simply raising the soil was going to be good enough. So although I added lots of organic matter to the beds over the years the soil did still get quiet sticky and needed a lot of fork work at the start of the season. So lesson #3 put in good drainage from day 1. So taking all these learnings into account this is what I came up with! Note: this is just sitting on deck, not it's final location! The box is made from 4" x 1" larch boards. I chose larch as it is a timber that is naturally resistant to rotting and wouldn't need preservative. The boxes are smaller than what I had previously at 5 1/2' x 2 1/2' approx. To avoid the narrower boards bulging out with weight of soil I put a bracing piece mid way. The corner pieces are made from 3" square fence post and as well as giving extra rigidity to the frame I also wanted to raise the frame up an inch off the ground. This gives me an extra inch for drainage/soil depth but also keeps the main timbers from sitting edge down on the wet soil, not that I expect the larch to rot but just some extra protection! When positioned in situ I tacked some old recycled Mypex around the inner base of the frame to retain the drainage gravel. 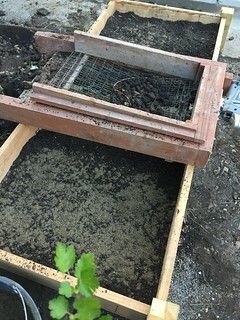 The purpose of the corner pieces is more evident in this photo as the box was intended to straddle across two path ways on either side of where the old raised bed used to be. and worked trough the mound to bring the sifted soil level up to about 2" from the top adding a few handfuls of washed sand along the way. This is where I stopped to think! The soil was nice a loose with the sticky clay balls removed but from past experience I know it is full of weed seeds. Open for suggestions here but my thinking is to just put a thick layer of rich compost on top to act as a mulch to keep the weeds at bay? 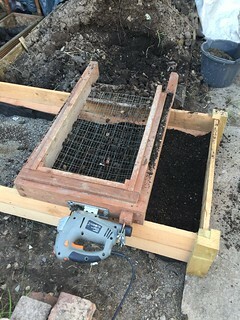 Or would it be better just to mix the compost into the sifted soil to improve the overall bed? Any thoughts? 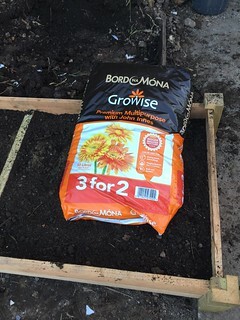 Decided to add a general fertilser 'Growmore' to the 'native' soil and then topped up with a layer of the Growise compost in the expectation it might keep any weeds in soil suppressed. 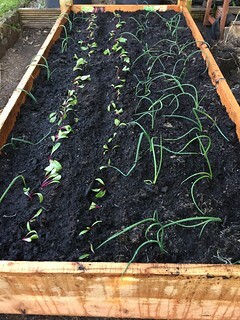 ...and finally starting to get veggies planted in the garden again, first in some beetroot and onion. Now for the 2nd bed!! Thanks to some fine sunny weather at last (and the long evenings!) I finished out the renewed veggie plot. Planted out 2nd bed with dwarf French bean and celery. 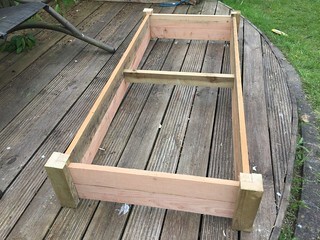 The cold frame was made to drop into the bed, currently with seed trays of herbs and mange tout. When the peas are ready to transplant into bed I'll lift out the cold frame. Thinking it will be handy in the spring to help bring on some early seeds. This photo shows the problem I faced with the raised beds in this part of the garden, shade! This photo was taken in mid afternoon and right hand side box is well in shade. The original 8' x 4' raised beds ran further to the right and that section was longer in shade. I put gravel down on walkways and with narrower box width the plants are easily accessible. I think the untreated larch looks well (I would say that!) and although I've downsized the plot I think I'll have plenty of produce this summer! All looking good and well Dan and gardening is indeed a learning curve. But I have said it on here many times before that what is in the photo is the only way to do raised beds, do it once and do it right. Your posts are the weak points. I would have used a few strips of larch and bolted them together to make posts. Yes it would be good to have the corner posts from larch too but used all my board up on the bed frame itself! In my case I knew that I wouldn't be sinking the corners in soil as they are resting on the cement pathways I have on the sides of old beds. Being made from a treated fence post I hope it will last a few years, also being on the outside corner and not in contact with the soil it will only have to survive 'normal' weathering. However time will tell but thanks for the feedback. 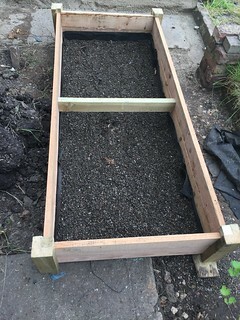 If you're sure raised beds are a good idea, the only real material to make them out of is concrete boards. They're obviously more expensive than timber BUT will last for decades. I put some in 11 years ago. They're now nicely weathered and, more to the point, as good as new. 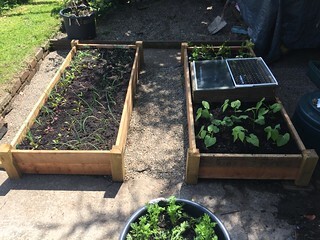 PS to the above, go to http://www.gardenplansireland.com/forum/about6779.html for a thread with a pic of my boards 'in action'. I used old builders scaffold planks for the last few years but alas they have rotted now and need replacing. Has anyone tried using recycled plastic ones, I've seen a few places do them online and it seems like a reasonable idea? - long lasting and much easier to move around and setup should the need arise. Come to think of it plastic scaffold or decking planks probably would do the same job much cheaper than the bed kits. You wont get plastic scaffold planks as they would never be able to take the loads imposed upon them. Timber or steel only is used.